Does anyone actually even understand Daylight Savings? Here I was super pumped about spring forward - not minding the lost hour of sleep on Sunday - because I couldn't wait for the sun to be out when I woke up in the morning! It wouldn't be dark anymore! It had been rainy the beginning of this week (and *ahem* right now, what the heck Houston. ), so I attributed the dark mornings to that. But surely I'd see my 6:00 am sun soon! How is it that I've lived for 29 years on this earth, have subsequently gone through 29 spring Daylight Savings(....es? ), and STILL I am shocked and completely befuddled every year when it happens? But I swear I'm not the only one confused! Man, woman, and all of God's creatures big and small seem to be completely bewildered. My dog Newton and the yapping birds outside my window seem confused. And I'll bet those fellas pictured above at Canyon Creek Bar & Grill are confused too. 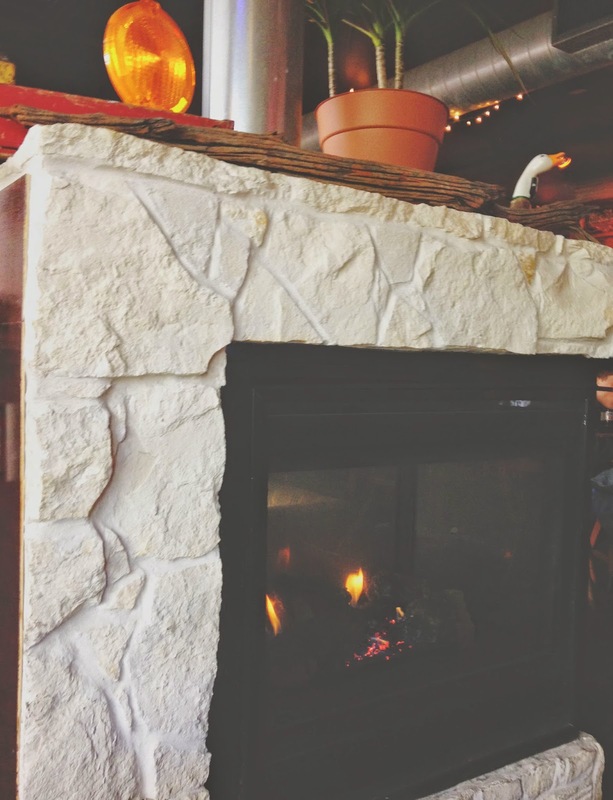 My mom and I went to lunch recently at Canyon Creek by Memorial Park, and we had a great time. I had been before, but only for drinks. I did have a certain high expectation of the food though because I am a big fan of Creek Group restaurants Lowbrow, Onion Creek, and Cedar Creek. 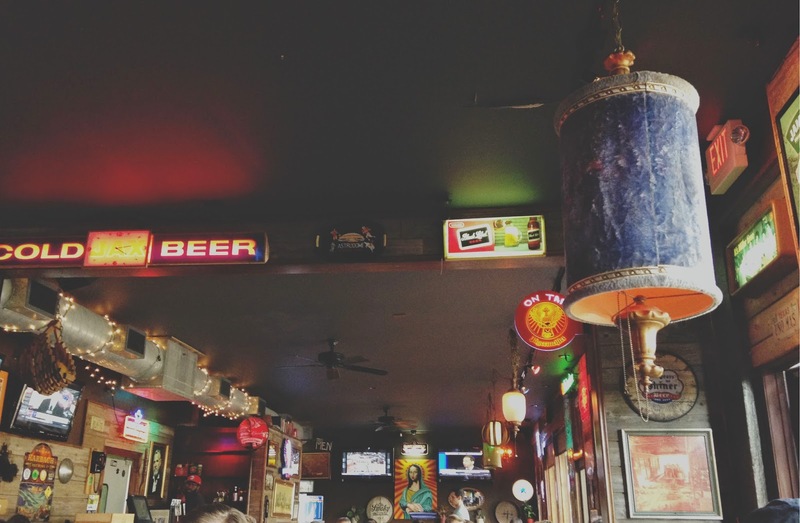 Much like Onion Creek and Dry Creek, the atmosphere is that of a fun, welcoming, neighborhood bar, where one would expect typical standard bar fare. And much like the others, first-time patrons are pleasantly surprised with creative, high quality, top-notch food. For the record, if my mother sees hummus anywhere on a menu, she can't not order it. So obviously she couldn't not order it (apologies for the excessive use of double negatives) when she spotted it on Canyon Creek's menu. 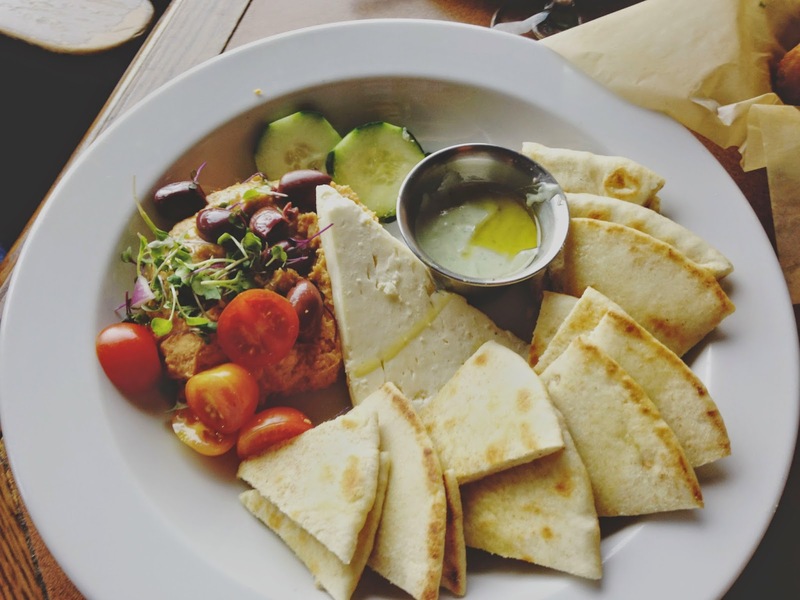 Canyon Creek goes above and beyond to make this roasted pepper hummus plate really special. Served with pita bread, vegetables, tzatziki sauce, and (what really sent it over the edge) a gorgeous hunk of feta, this beautiful plate was vibrant, fresh, and light. The creamy, mild hummus, salty olives, crunchy cucumber, and tart feta fused together perfectly atop a piece of simple pita, drizzled with the light tzatziki. Without much persuasion from me, she also ordered the fried pickles. As a general rule, I like fried pickles. 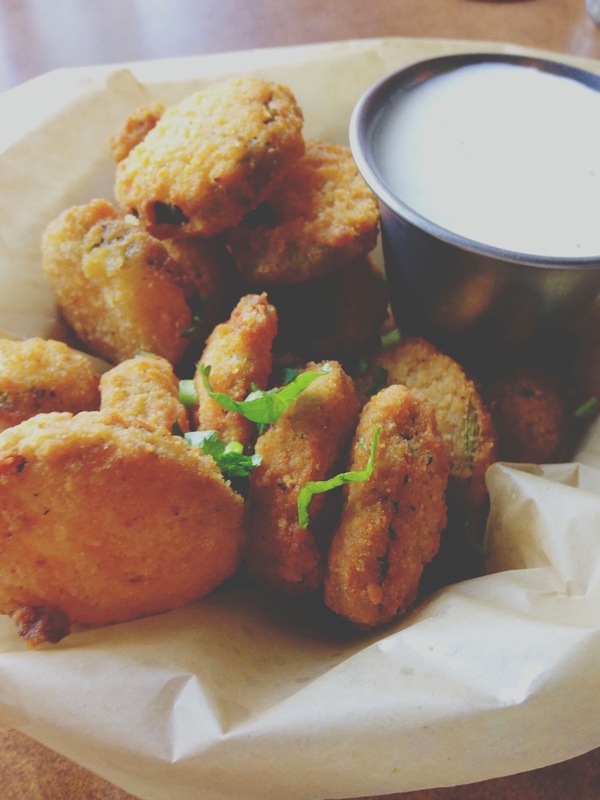 As a new general rule, I freaking love Canyon Creek's fried pickles. Best fried pickles I've ever had. For my meal I ordered the luckenburger with a soy boca patty and no bacon to make it vegetarian. 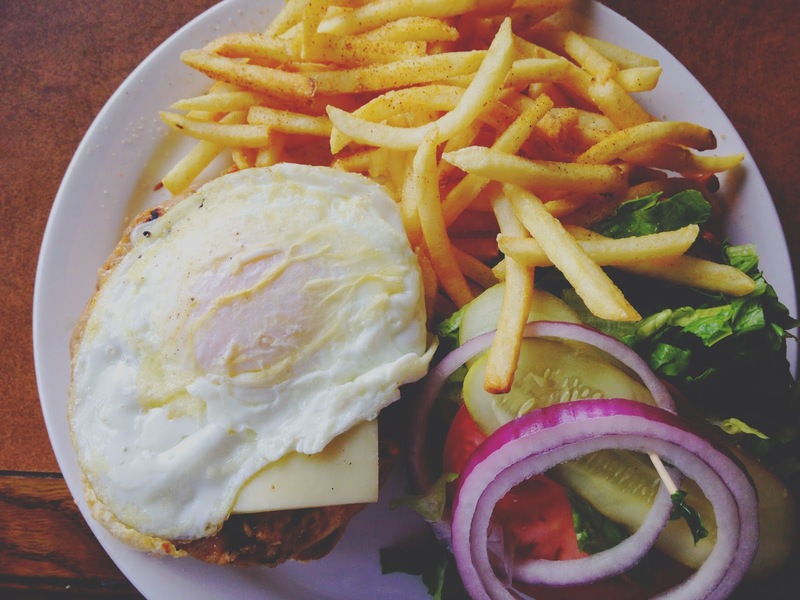 I'll admit it - you could slap a fried egg on a piece of paper, and I'll eat it. So put one on a veggie burger, and I'm happy as a clam in high tide! The patty itself wasn't anything exceptional (though I do go nuts over the hummus wrap with soy boca patty at Onion Creek, which admittedly is probably the same patty). 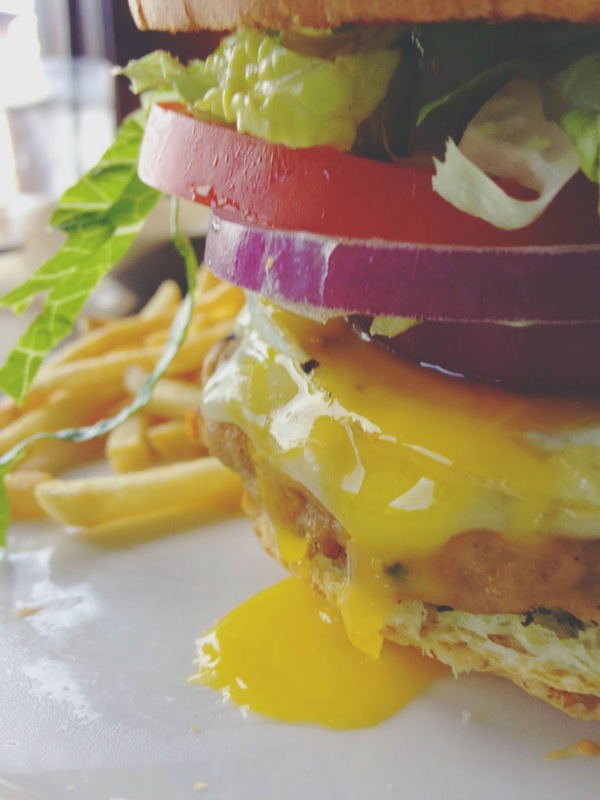 But the egg, smooth white cheddar, crisp vegetables, and fluffy buttery bun gave the patty a significant extra nudge, which made the dish enjoyable. So while it wasn't my favorite veggie burger I have ever encountered, or even in the top five, it was still a respectable contender. Ugh, and those fries. Just like the fries served at Onion Creek, they had a zippy seasoning, and were delightfully crunchy. Dip 'em in the broken yolk, and I swear you'll see stars. I am beyond happy to report that I have fallen in love with yet another Creek Group joint. 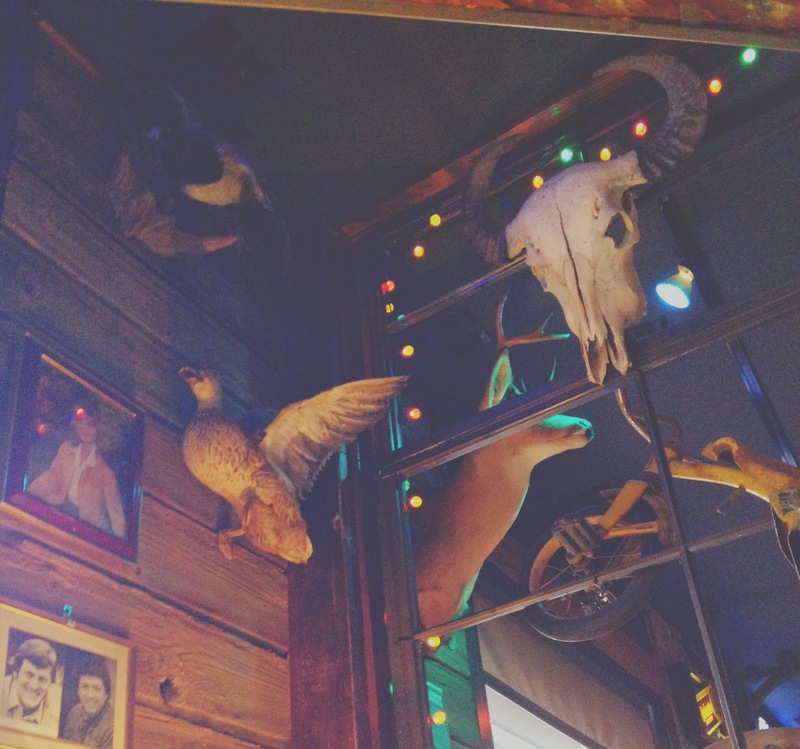 Canyon Creek is a lively, fun spot, serving inventive, delicious, beyond-standard bar food. It's definitely gained a secure spot in my Houston restaurant rotation, and I definitely recommend adding it to yours!